Edigital Marketing recognizes the rising demand for education in its three core areas; that is SEO, Digital Marketing, and Web Design. For this reason, we have fashioned a sustainable education system that will ensure that Students and Companies get to learn valuable skills in these three areas. All they have to do is enroll for our One on One Training in Digital Marketing, Bangalore here. 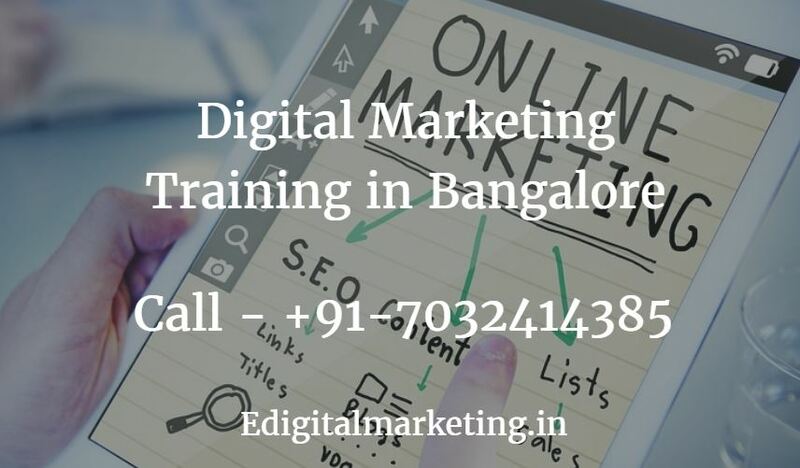 Why Edigital Marketing is the best place to learn Digital marketing in Bangalore? As a reputable Digital Marketing company in Bangalore, we are helping dozens of students and companies familiarize themselves with SEO, Digital Marketing as well as Web Design. This constructive training will help our trainees save a good deal of money: Money that they would otherwise have spent on hiring professionals to do the job for them. Our training equips you with every skill pertaining to Digital marketing, meaning you don’t need to hire anyone to do any of the three tasks for you (i.e. SEO, Digital Marketing, and Web Design). Moreover, with our guaranteed EDM Certification, you can always get hired to offer these services to other clients as well. EdigitalMarketing understands the very challenging nature of learning SEO and Web design for a newbie student. We, therefore, integrate easier learning strategies in our One on One Training program in Bangalore, so that students don’t get stranded while learning. You get to learn digital marketing from a reputed Bangalore SEO agency, where you can work on real projects. If you are interested in internship, you are more than welcome. We do not charge any amount for internships. You can start your own SEO or PPC or a complete digital marketing firm, or work on various freelancing projects for clients and start making money from your home. Unlike many One on One Digital Training agencies, we acknowledge that effective learning is not realizable without exposure to real-life situations. We, therefore, create openings for our students, where they can put the learned skills into practice. Through our wide network of clients and partners, we are able to secure internship positions for our learners. In addition, we can handle bigger agencies and companies, looking for an in-house Digital Marketing training package for their employees. Our staff is sufficient to train a team of 50-60 students intensively at any one time. Affiliate Marketing: You also get to learn about affiliate marketing. You can start partnering with websites and sale their products and services and earn money. Ecommerce Marketing: You also will get to know how to create an ecommerce website and how you can start making money from Day 1. Why would you opt for a Private Digital Marketing Training in Bangalore? Since businesses differ in terms of marketing needs and promotional inputs, a private Digital Marketing training will at the very least help you understand what will work for your particular type of business and what won’t work. Most companies find it awkward to train their employees in a workshop set up. As a matter of fact, this traditional method of training employees (through workshops) has been proven to be ineffective if compared to private tutoring sessions. Contrary to what you find in public workshops in the field of Digital Marketing, our private tutoring program personalizes the learning process to the very specific learner. This, of course, can’t be compared to the ‘knowledge-broadcasting’ you find in a workshop scenario. We don’t want your team to feel out of place like they would if they attended a seminar full of strangers: Not to mention a seminar that’s discussing just a handful of what’s relevant to your company. At EdigitalMarketing.in, we focus our training sessions to the unique needs of your company and specific industry.